With the Restoration a new era opened in Mitcham, dubbed ‘The Montpelier of England’ by an eminent physician of the day, on account of its fine air. The village continued to attract the wealthy, notably London merchants and lawyers seeking a healthy residence away from the perpetual threat of plague in London. Eagle House, probably the finest of Mitcham’s houses, dates from this period, being built, it is believed, in 1705 for Fernando Mendes, previously physician to Queen Catherine, wife of Charles II. 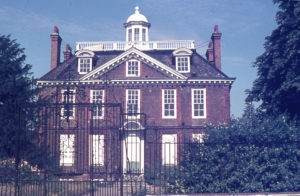 Eagle House was later occupied by Sir James Dolliffe, a director of the South Sea Company. By the 1660s Epsom had already become a spa much favoured by Londoners. With the opening of Westminster Bridge and the establishment of a direct stage coach link from London to Brighton in 1745, several Mitcham hostelries were established or refurbished at this time. The earliest surviving inn, the former King’s Head (renamed the Burn Bullock in 1975 in memory of the licensee, a famous local cricketer) dates in part to the late 16th or early 17th century, but with a modernised front from about 1760. The White Hart was a posting house, from which post chaises and mounts could be hired, and from the stables at the rear Mitcham’s first horse bus service was run by the Holden family. Before the Napoleonic Wars, stage coaches were leaving for London at half-hourly intervals during the morning and evening ‘rush hours’, reaching Gracechurch Street within the hour. The high roads from London to Brighton, via Tooting and Sutton, and another through Colliers Wood to Epsom, were turnpiked in about 1745, under an Act of 1734/5. Two milestones erected by the trustees survive: one at Figges Marsh and another, inscribed ‘Whitehall 8½ mls Royal Exchange 9 mls’, at Lower Green West. In the 18th and 19th centuries Mitcham was best known for the cultivation of medicinal and aromatic herbs and the distillation of essences and perfumes. In 1749 Ephraim Potter and William Moore began the distillation of lavender water on an industrial scale. Although lavender was to become synonymous with Mitcham, it was actually exceeded as a crop by peppermint, the oil from which was much in demand from the makers of cordial waters as well as from apothecaries. Other herbs grown included camomile, wormwood, aniseed, damask roses, and liquorice. During the 18th century the textile printing industry in the Wandle valley reached a peak of prosperity, and from Carshalton to Wandsworth bleaching works, colour or logwood mills, and printing works flourished along the river banks in response to the demands of fashion for printed chintzes and calicoes. After the turn of the century changes in fashion, and growing competition from the industrial north of England, brought several of the Mitcham manufacturers to bankruptcy. Snuff milling was another industry dependent on the power of the Wandle and the dictates of fashion, particularly during the 18th century.